The leader of a small right-wing party threatened on Monday to pull it out of Greece’s governing coalition if a deal settling a row over the name of the Former Yugoslav Republic of Macedonia (FYROM) comes to parliament, increasing uncertainty in a country that just emerged from bailouts. Leftist Prime Minister Alexis Tsipras and Panos Kammenos, leader of the Independent Greeks party, joined forces in 2015 with the stated aim of pulling Greece out of its then-debt crisis and fight corruption that flourished under socialist and conservative rule and pushed Greece to the verge of bankruptcy. But the new deal Tsipras’s government struck with FYROM that changes its name to North Macedonia has shattered the coalition’s honeymoon after Greece’s bailout exit in August, refocusing attention on the coalition’s contradictions. “I won’t vote for this deal if it comes to Parliament,” Kammenos, who is defense minister, told state TV ERT after a trip to the United States, where he presented his party’s stance and what he called an alternative scenario, if the deal fails. Greek nationalists have opposed the name deal, contending that Macedonia is historically Greek and part of Greek heritage. Greece maintained for 27 years that FYROM’s name implied territorial claims to its northern province of the same name, and so blocked Skopje’s path to European Union and NATO membership. The June deal approved by Tsipras removed that obstacle, and has been embraced by both NATO and the EU. But the deal has been thrown into doubt by the failure of a referendum in FYROM to achieve the minimum turnout needed to uphold the accord. 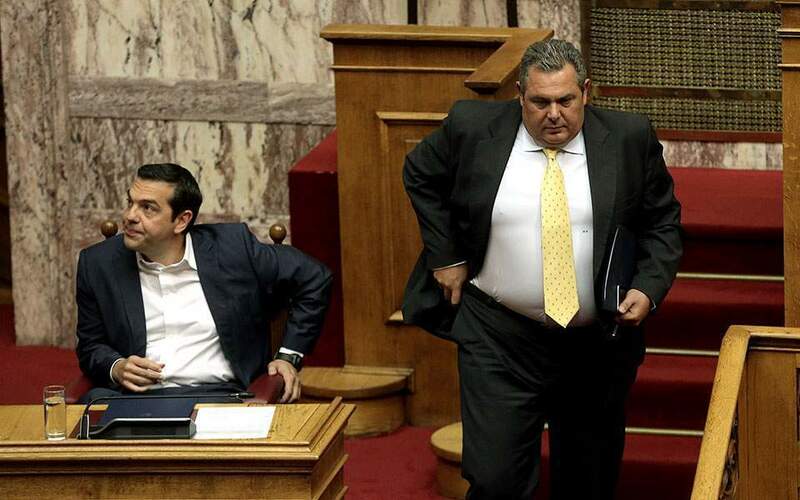 In that light, Kammenos said, the deal is unlikely to come before the Greek parliament for approval. Greece’s coalition government, whose term ends late next year, is backed by 153 lawmakers in the 300-seat parliament. Kammenos’ party holds 7 seats. Tsipras has repeatedly ruled out early elections. But in an effort to ease fears of a government collapse if the FYROM deal comes to the Greek parliament for a vote, government officials have said that support from independent and center-left lawmakers has already been secured. But Kammenos’s comments triggered heated debate, even within Tsipras’ leftist Syriza party. During a weekend meeting of its central committee, members said the partnership was unraveling. “It’s a big political issue when a government partner says he disagrees to the point of being forced to withdraw his confidence in the government,” senior Syriza official Panos Skourletis said on Monday.